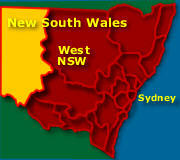 See map of New South Wales NSW Maps or the Weather Far West NSW Weather. 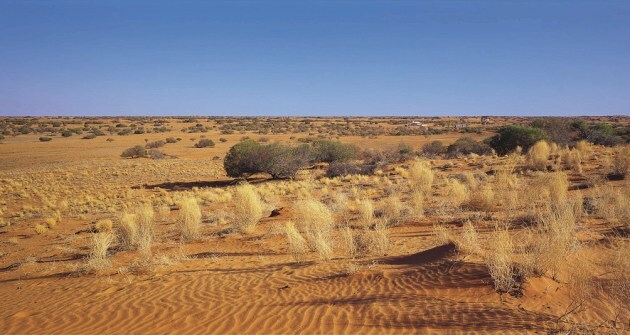 The New South Wales Outback is both an amazing and memorable place to visit. Along with the many historical mining towns, some with underground motels, you can experience vast deserts, Aboriginal heritage and quirky local characters. Places to visit in the NSW Outback and worth exploring include Mungo National Park, located in the Willandra Lakes World Heritage Area and the Mount Grenfell Historic Site. Bourke in the north west of NSW is in typical deep inner Australia country. The normally dry, sun drenched surrounding of the city has countryside with small mining towns and beautiful National Parks. Broken Hill, nicknamed the Silver City, Lightning Ridge and White Cliffs are attractions on their own. Opals, High-grade silver, lead, zinc, copper and gold have been found in the region, and a recent ore find has once increased activity in the region. Cobar in the north west of the NSW Outback has heritage to explore and working mines you can visit, including the Peak Gold Mine. Following the discovery of opal in the 1890s, the town of Lightning Ridge in the Outback became synonymous with opals, particularly black opal. You can even explore some of the town’s older non-operational mines, they allow visitors to descend underground on guided tours. At Lightning Ridge’s Artesian Bore Baths the potassium-enriched water, claimed to be beneficial for rheumatic and arthritic pain, flows from deep underground into an outdoor pool at a constant temperature of 42°C. Golfers should attempt the Lightning Ridge’s ‘country’ golf course and bring the camera. For events, The Lightning Ridge Rodeo is a two day event held in April. The stands are packed with locals and visitors cheering the cowboys and cowgirls demonstrating their many skills. Another town known for its Opal is the town of White Cliffs. Most of the 200+ residents have made their homes in modernized dugouts, the remains of old opal mines. Visitors can even stay in an underground hotel or bed and breakfast. Here, the older abandoned opal diggings have created a landscape reminiscent of the moons surface. The town of Wilcannia, where the Barrier Highway (A32) crosses the Darling River. It played an important role as a deep inland river port, reaching its heyday in the 1880s with the paddesteamers, earning the title of ’Queen City of the West’. At the Mount Grenfell Historic Site, you can find hundreds of examples of ancient aboriginal art inscribed on the rock walls and overhangs. Painted in the traditional red, yellow and ochre colours, these sites have been used in religious ceremony and for teaching their children for thousands of years. See Cobar, NSW. Another incomparable area in Outback New South Wales is Mungo National Park, 150 km north-west of Balranald and centre of the Willandra Lakes World Heritage region. Humans have occupied this area for at least 40,000 years. Up until about 19,000 years ago, the lakes were full of deep, fresh water. Along the shoreline, The Barkindji people camped, feasting on freshwater mussels and catching golden perch and Murray cod. Due to climate change, the lakes here completely dried up and the Willandra Lakes have been dry ever since. Wind and water erosion, helped sculpt the remarkable 33-km-long Walls of China natural rock formation. The clay and sand that packed up against this natural wall over the centuries has provided scientists with a time capsule, recording the many past climatic variations. The region has been inscribed on the World Heritage list since 1981. See Wentworth. A memorable outback experience for backpackers and visitors to New South Wales consists of working for a time as a jackaroo or jillaroo (cowboy or cowgirl) for an outback cattle station. 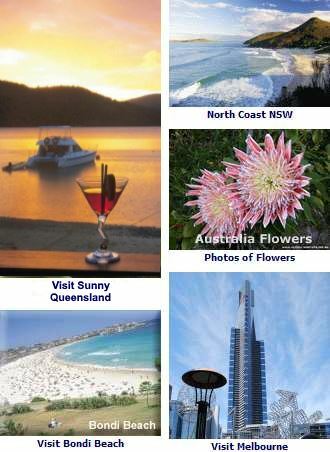 Jackaroo schools are holiday based - participants are generally backpackers and many are visiting Australia under the reciprocal Working Holiday Maker (WHM) scheme. A classic example is the Leconfield Jackaroo and Jillaroo School, a working property of 4600 acres, set in the hillside country of the Mulla Creek area in northern New South Wales. Phone +061 2 6769 4230 for more information. Along with caravan parks, motels, chances to camp, there are hotels and self contained apartments in the towns including Lighting Ridge, Broken Hill and White Cliffs as well as the surrounding towns. There are also try the Bed and Breakfasts, Pub stays and Farm stays.